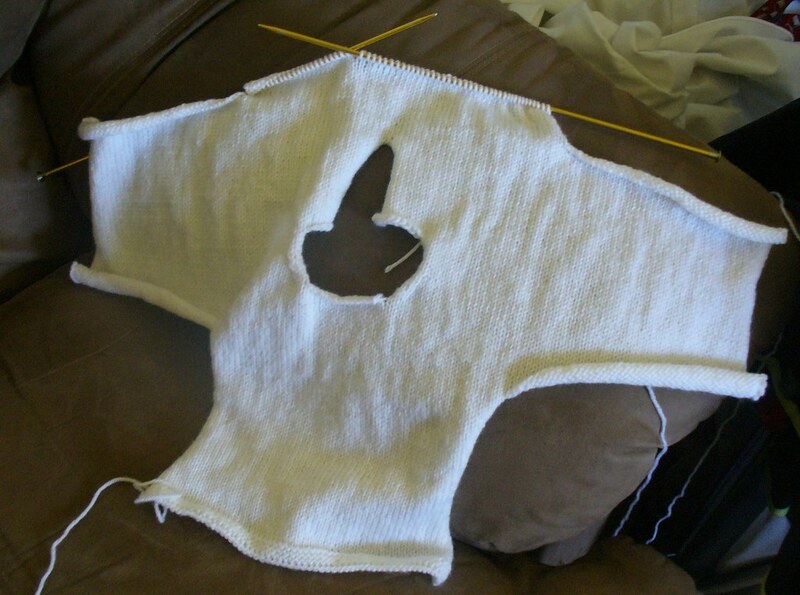 Yeah, I’ve been knitting again. I decided to make something else for the future soccer superstar using my womb as a practice field. Turns out that my local library does carry craft books, although not too terribly many (or of recent publication). One that did catch my attention, though, was Simple Knits for Cherished Babies by Erika Knight. I don’t know what it was about it that made me check it out. Possibly the key lies in the use of the word ‘cherished.’ It’s a lovely word, with lovely connotations, and it’s one that you don’t often hear these days. That, combined with the tempting ‘Simple’ proved too much for me to resist, and it went home with me. Having said that, I will tell you that it is actually a good book. Not a great book in terms of pattern creativity, but I would buy it. At a yard sale. Or perhaps a thrift shop. Even my local used book store (if I had one). I would place a seven-dollar value, tops, on its pattern-stash value. And I have a rampant case of PAS (pattern-aquisition syndrome). I picked out a simple sweater suitable for my little boy (there are a few yummy options for girls, but…well…) and I studied it out. I’m no fool (at least, I don’t think so): I realized that my first knitted sweater would probably challenge me. At any rate, first I had to find a substitute yarn for a ‘medium’ cashmere yarn. Yeah. Cashmere. (Apparently ‘cherished’ = ‘rich.’) If I’m not wearing it, I’m certainly not going to dress my baby in it. Sorry, kiddo. A simple gauge swatch, however – something unprecedented in my knitting – revealed that Bernat Softee Baby would be a good substitute. Well and good. 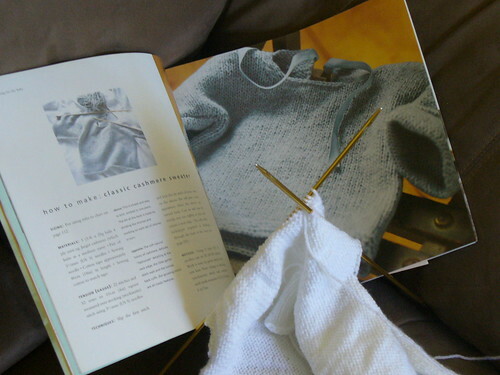 It looked like a simple project, a pullover sweater, just knit up the front, add stitches for the arms, go around the neck, reconnect and knit down the back. Something like that would be a piece of cake for me in crochet. I suppose I didn’t think about what, precisely, that would entail with knitting needles. I’m almost finished now, and I want to show off, so I’m going to show you what I’ve got before I continue talking about it. So, just for this project, I have so far knitted a gauge swatch for the first time, learned how to cast on extra stitches after I’ve already started, learned how to split my stitches and work two balls of yarn at once (that was a doozy of an evening), and, of course, there was the happy day when I went back to a single ball of yarn. (Yay!) I’m on the home stretch, and soon I will have completed my first knitted garment ever! Here’s a shot of the sweater, studying to be a better sweater. I crack myself up sometimes. In crocheting news, my sweater Genevieve has moved to the first round of testing with the help of the fine ladies at Crochetville! I’m very excited about getting it going again, it was kind of stalled for a while. Hopefully I’ll have another pattern or two go into testing in the next few weeks. It makes me happy. Oh, and I try to keep my bloglinks to the right full of blogs that are actively being updated with cool stuff, so check them out! There are some new faces in the lineup. looks awesome melissa! i used bernat coordinates for my first baby sweater. it lovely too. i like challenging patterns as well, good practice to ante up the skill set!